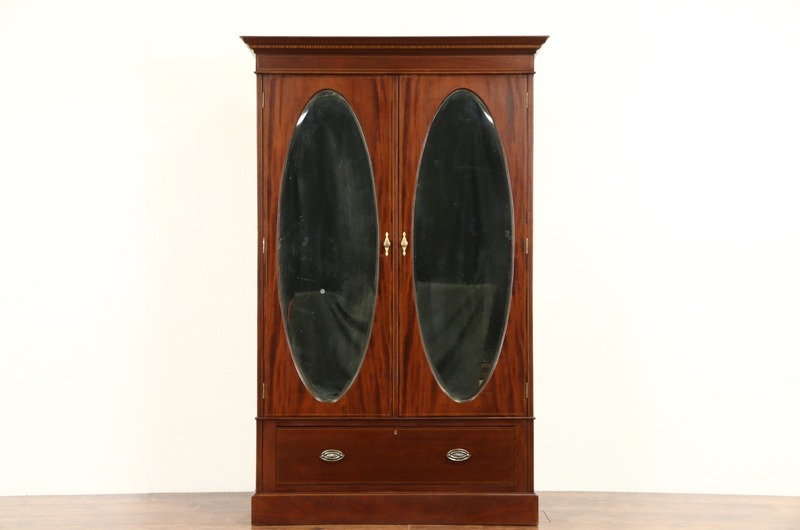 Hand crafted in England about 1910, this armoire, wardrobe or closet is fitted inside with hooks and pull outs for hangers. Mahogany inlaid with satinwood and ebony banding, the restored finish is in excellent condition. There are minor dings and losses at the edges for a little antique character, see photo. Original oval beveled mirrors have a little "smoke" as shown. The large lower drawer has hand cut dovetail joints on this historic furniture. Hardware is brass and this armoire can be disassembled if necessary for moving. Measurements are 50 1/2" wide tip to tip, 21" deep and 80 1/2" tall, interior depth is over 17." See 26 photos that enlarge to full screen size.